“his own group, the Mezhraiontsy “, is it so? Russian Social Democrat Labor Party split into various factions along political and ethnic lines since 1903 after the original division between the Bolsheviks and the Mensheviks. Bolsheviks; The RSDLP was founded in 1898. The Bolshevik faction ”RSDLP (B)” emerged in 1903-1907. The Mezhraiontsy, usually translated as the "Interdistrictites", “Mezhraionka" for the organization and "Mezhraiontsy" for its followers. The Mezhraiontsy group was founded in November 1913 by (Konstantin Yurenev, A. M. Novosyolov , Elena M. Adamovich and Menshevik, N. M. Yegorov. Yurenev was the leader of the organization until May 1917. Karakhan Lev M, a member of RSDLP who did not choose to be with the Bolsheviks at the split, joined the same year to Mezhraiontsy group. By late 1915 the organization had 60 to 80 members. Mezhraiontsy group published a journal called, Vperyod. One publishing was put out illegally in 1915. They kept themselves independent from both the Bolsheviks and the Mensheviks. Although the Trotskyites claim that they have established a contact with Trotsky and the editors of Nashe Slavo , they could not give any information as to the purpose or end results of this contact. In April-June 1917, the Mezhraionka had become a natural place for prominent social democrats like Leon Trotsky, Adolf Joffe, Anatoly Lunacharsky, Moisei Uritsky, David Riazanov, V. Volodarsky, Lev Karakhan, Dmitry Manuilsky, and Sergey Ezhov (Tsederbaum), Adolf Abramovich, all of whom joined during that time. Publication of Vperyod (Forward), was resumed legally at this time, when February Revolution broke out, the organization had 400-500 members, and eight issues of Vperyod were put out. After the Sixth Congress of the Party the editorial board was changed, and No. 9 of the journal appeared as the organ of the Central Committee of the RSDLP (B). Publication was discontinued in September 1917 by decision of the Central Committee. 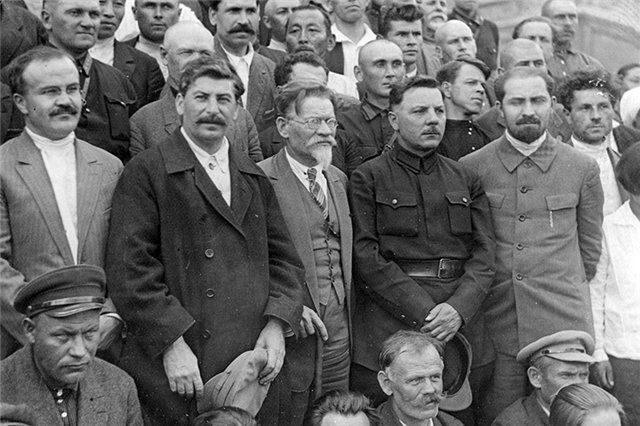 Lenin, Kamenev and Zinoviev attended a conference of the Mezhraiontsy as guests. 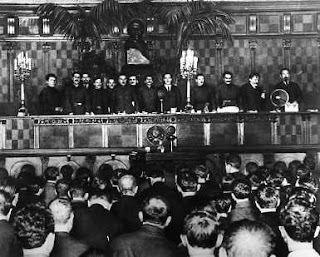 Lenin brought the proposal to the Mezhraiontsy conference which was approved by the Bolshevik Central Committee. He spoke at the conference, proposing a unification of all internationalist social-democratic groups. 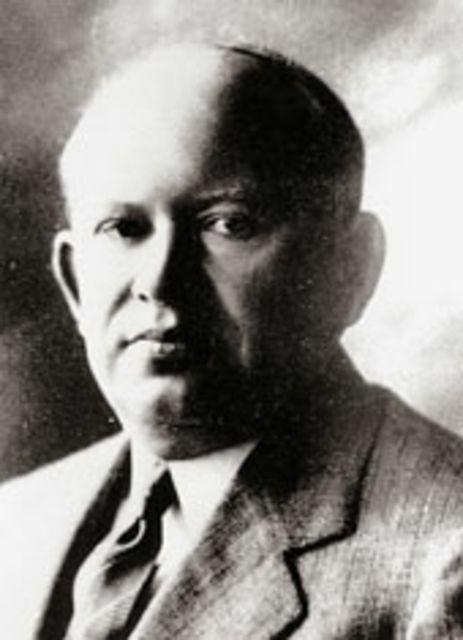 In conformity with Trotsky, Konstantin Yureniev, the leader of the Mezhraiontsy opposed an immediate merger with the Bolsheviks for several weeks. On May 31 (May 18, O.S.) Pravda published Lenin’s proposal for Bolshevik unity with Mezhraiontsy. The political resolutions of the Inter-District Organization (Mezhraiontsy) have in general adopted the sound course of breaking with the “defencists”. Under the circumstances, any division of forces would, in our opinion, be utterly unjustifiable. The Mezhraiontsy include a formidable group of Marxist leaders, many of whom would play a major role in the October Revolution and the early Soviet government. 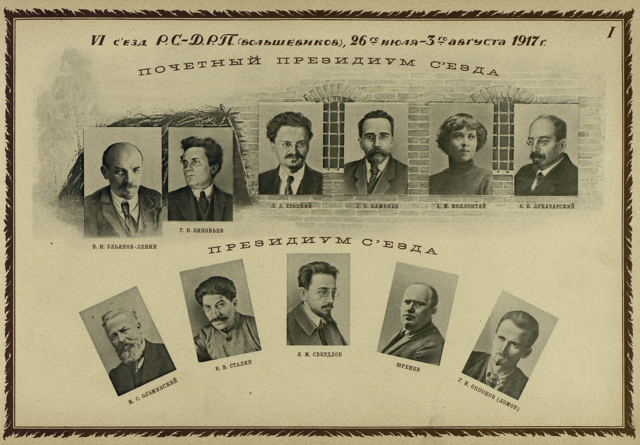 Along with Trotsky, they include Anatoly Lunacharsky, Adolf Ioffe, Lev Karakhan, Moisei Uritsky, David Riazanov, and Konstantin Yureniev. A few former members of the Mezhraiontsy, including Grigory Sokolnikov, have already joined the Bolshevik Party. “Trotsky had regarded Lenin as more of a rival than as a collaborator. This rivalry had motivated many of Trotsky's actions in the past that is before the 1917 revolution, and during the revolution. It would continue to do so in future as well. During the revolution, Trotsky's rivalry with Lenin took several forms. It showed itself distinctly three times. The first was when in May, in negotiations to join the Bolshevik party, he declared that he could not call himself a Bolshevik. In effect this was saying that the party should change its name. The second time Trotsky's rivalry with Lenin revealed itself was when warrants were issued for the arrest of Lenin and Zinoviev and Kamenev. Trotsky, instead of going into hiding as Lenin had done, in fact had done the opposite. Trotsky wrote a letter to the Provisional Government requesting the issuing of warrants for his own arrest as well. Thus, Trotsky saw warrants of arrest as a badge of honour, which he had at all cost to wear if Lenin wore one. In this way, we see that Trotsky not only placed his own life in danger, but his own personal glory before the interests of the revolution. He wanted to go to prison (6) at a time when there was a broad agreement between the Bolsheviks and the Mezhraiontsy and the possibility of a merger was high yet he was against it. Trotsky had found himself in opposing minority. the presidium of the Sixth Congress. Lenin, Zinoviev, Trotsky, Kamenev, Kollontai, and Lunacharsky. 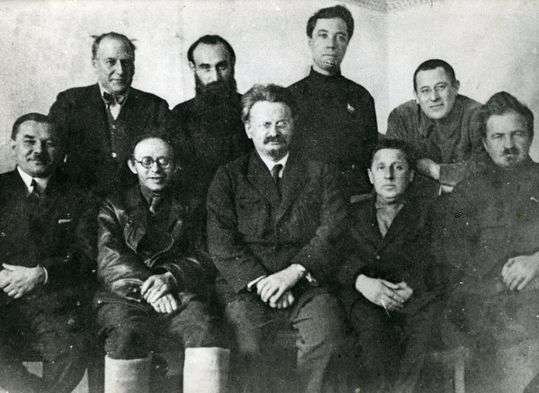 Olminsky, Stalin, Sverdlov, Yurenev, and Oppokov. At the elections to the Petrograd district councils in June 1917, the Mezhraiontsy and Bolsheviks formed a bloc. And later at the Sixth Congress of the Russian Social Democratic Labor Party (Bolshevik) July 26 to Aug. 3 (Aug. 8–16), 1917, the congress approved the admission of the Mezhraiontsy to the party. Trotsky was in “voluntary” prison, Lenin was in hiding. History of Communist party notes; "During the Sixth Party Congress the Mezhrayonsti declared that they were in agreement with the Bolsheviks on all points and requested admission to the Party. The request was granted by the congress in the expectation that they would in time become real Bolsheviks." So the acceptance of Trotsky to the Bolshevik party was –conveniently so - through the acceptance of Mezhraiontsy group to the party. Mezhraiontsy was not `Trotsky’s own group as Tony Cliff and other Trotskyites rewrite the history, nor was he the leader of the group till the end. Trotsky was not a Bolshevik before, at the time he was accepted through the group, and after the revolution. He was never a Bolshevik. The term “Old-Bolsheviks” does not apply to those of the Mezhraiontsy who supported Trotsky’s conception of the Russian Revolution and the theory of permanent revolution before and after the revolution. 1 - Tony Cliff, "Building the Party: Lenin 1893-1914"
Boris Souvarine, "Stalin: A Critical Survey of Bolshevism"